Julie Gaitskell at one of the cross country fences. Martin and Julie Gaitskell have drawn on their individual expertise to diversify the business at Highfield Farm, on the beautiful coast of the Solway Firth at Burgh-by-Sands near Carlisle. Running what was originally a traditional dairy farm, the couple are capitalising on the area becoming a newly discovered tourist destination with the recent opening of the Hadrian's Wall footpath, which is only a stone's throw away, and they are providing quality farmhouse bed and breakfast as well as running a small campsite for visitors, including horse owners, under the name of Highfield Holidays. And Julie's lifelong experience with horses and eventing has led to the development of a successful livery business and now a farm ride and cross country training course intended for use by both local equestrian enthusiasts and holidaymakers with their own horses. Highfield Farm in the hamlet of Boustead Hill, overlooking the scenic Solway Firth with its wealth of wildlife, has been in the family for almost 100 years. The Boustead herd of pedigree Holstein Friesians was founded by Julie's great uncle William Peel in the 19th century and he was the first to import Canadian Holstein bloodlines into the UK. Julie and Martin met through Young Farmers when Martin, originally from south Cumbria, was the county chairman. They have a six year old son, Alastair, and two year old daughter, Freya. They took over the farm 12 years ago but last summer, due mainly to a general industry problem of finding suitable labour, they sold the milking portion of the 160-cow Holstein Friesian herd, retaining the youngstock which are coming into milk this summer. This breather from milk production has enabled the couple to re-examine the farming enterprise under today's CAP changes as well as concentrating on the diversified ventures. “Our main enterprises are the farm and Julie's livery business,” said Martin. “We have made the farm a one man system with the youngstock coming into milk. I will milk about 60 cows which I think will be viable. Martin will continue to contract rear heifers which he started last year on the 270 acre farm. All but 50 acres is in grass with barley, wheat and triticale being grown for home use with the aim of being self sufficient. The livery business came about through Julie's love and expertise of horses. 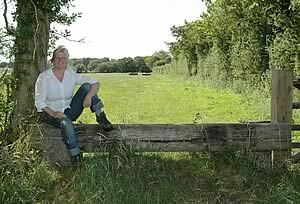 A successful competitor in eventing for a good number of years, Julie saw the opportunity to build extra loose boxes for livery animals in the yard next to the house which has no access to farm vehicles or stock. Now there are 15 loose boxes used for livery, from DIY to full service, which can also be used by riders who want to bring their horses on holiday. With an increasing interest in equestrianism, most of the liveries are taken by local people from the surrounding villages and from Carlisle seven miles away who are attracted not only by the facilities on the farm but also the rural rides in the Solway area. With the help of a Defra grant, the facilities for riders were further developed with the building of a cross country training course and ride around the farm's grazing, arable and moss land which is a haven for bird and wildlife. The farm also has an outdoor arena suitable for dressage as well as a horse walker and all are available for hire to riders. Julie, who is a BHSAI qualified riding instructor, gives lessons on the farm. The accommodation is rated with four diamonds from the English Tourist Board. “Since the Hadrian's Wall footpath opened which just passes our farm gate we are getting more and more visitors to the area which until now has been undiscovered by tourists so we saw the opportunity to also branch into horse holidays,” she added. Boustead Hill is only six miles from the western end of the 84-mile long walk. Enterprising Julie has had the brainwave of creating humorous T shirts and car stickers based on a character she has invented called Little Hadrian, which she sells to guests and are also available from retail outlets in the region. T shirts feature slogans like - 'I came, I saw, I blistered' on the back! The new camp site has this year attracted a wide range of visitors from this country and from abroad and those who enjoy walking are also free to walk around the farm ride. Features of the farm, including the 60 acres of moss ground, areas of old woodland, the wildlife and open access make it ideal for the Countryside Stewardship scheme. Martin is already intending to go into the entry level scheme and will also be considering the higher level scheme. “We still want to maintain a business farming but we don't think it is sustainable living without other enterprises. Likewise, we want our guests to enjoy all that the farm has to offer,” said Martin. “We want to build and consolidate the ventures we have already started and keep our options open for the future. We haven't got to be afraid to change. We have considered organic farming but I think to get the benefits you need to be able to directly market what you produce. There are a lot of hidden costs,” said Martin. © Copyright 2005 Jennifer MacKenzie All Rights Reserved.